At Sheraton Vistana Villages St Augustine, you’ll be within reach to all of Orlando’s wonderful attractions and have luxurious, modern conveniences right at your doorstep. SellMyTimeshareNow.com can help you find the perfect timeshare resale or rental at up to 70% off the retail price! At Sheraton Vistana Villages St Augustine Villas, timeshare owners won’t be settling for anything less than luxury and convenience. 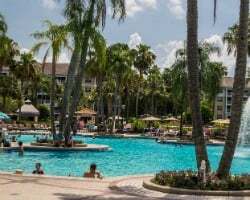 Located within 20 miles of SeaWorld Orlando, Universal Studios, and Walt Disney World, Sheraton St Augustine put your right in the center of all the magic of sunny Orlando. Everything from renowned golf courses, once-in-a-lifetime skydiving adventures, and ecotours are within a short distance from the resort and will help create great memories for you and your family outside of the theme parks. The fun doesn’t stop once you leave the parks though. 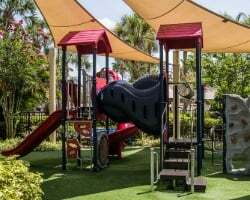 Sheraton St Augustine Villas features incredible amenities including three amazing pools with a playground ship for the little ones, quality restaurants like the Flagler Station which serves top-quality American fare, and a relaxing sauna to help you unwind to the fullest during your vacation. Spend time with the kids at one of the on-site game rooms or basketball courts, Then, once the sun goes down, drop them off at the Sheraton Kids Night Out, where they’ll share fun activities with the resort staff while the adults in your party go out to Downtown Disney or Pleasure Island for some adults-only entertainment. Return to your comfortable one- or two-bedroom villas at the end of the day and lounge in the relaxing atmosphere. Wake up every morning to a wonderful view of the St Augustine pool, cook breakfast in the fully equipped kitchen, and enjoy it out on your own private balcony. Get started planning your next magical adventure today! Fill out the form on the right or give our Sheraton Vistana Villages St. Augustine Villas timeshare resale specialists a call today at 1-877-815-4227. Buying a Sheraton Vistana Villages St Augustine timeshare resale means you’re purchasing a property directly from the current owner. The price listed is assessed against the current trends of the resale market and is the fair market value of the ownership. Unlike purchasing a timeshare from the developer, there are no hidden fees when it comes to timeshare resales. Travel back to your Vistana Villages St. Augustine timeshare at the same time every year with a fixed week, or choose a floating week if you desire more flexibility. Sheraton St Augustine weeks can be used annually, biannually, or biennially, and floating weeks can be used in a variety of different seasons such as Gold and Platinum. Year after year, Sheraton St Augustine owners will experience luxury and serenity like no other. All Sheraton resorts are a part of the Starwood Vacation Ownership catalog. Starwood features a plethora of resorts that have a reputation for their state-of-the-art services and amenities at cost-effective rates. Sheraton St Augustine is one of many sought-after Starwood properties by travelers all over the world. Learn more about Starwood at our Starwood Information Center. Choosing to own a Sheraton St Augustine timeshare means that you have the ability to purchase a membership to the resort’s affiliated external timeshare exchange company Interval International. II is the industry’s second largest exchange company and hosts over 2,900 resorts in 80 countries. Sheraton Vistana Villages St Augustine is an “Interval International Elite Resort”, which gives owners a substantial amount of trading power in the exchange program. Your vacation is what you make it. There are plenty of ways to keep active like the tennis courts, Sheraton fitness center, or the jogging path that winds throughout the resort. There are also decompressing activities to help wind you down on your getaway, such as the outdoor whirlpools, massage centers, and a stroll through the Villages Marketplace. 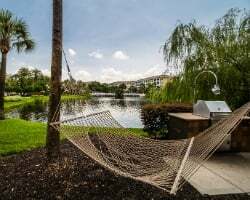 Sheraton St Augustine is also conveniently close to the hub of Orlando while being a fair distance away to escape the hubbub. Take the kids on an educational adventure through the Kennedy Space Center Visitor Complex and experience the Astronaut Training Experience, check out some fascinating aquatic life at the Sea Life Aquarium, or embark on a shopping spree at the Orlando Premium Outlets. Fall and winter travelers can catch an Orlando Magic game when the team is in town, or if you’re vacationing in March through May, you can go check out the MLB Spring Training games. 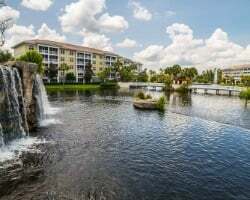 Already Own at Sheraton Vistana Villages St. Augustine Villas?